We heard the news with glee, a substitute. My high school freshman PE teacher was out for the day but the class was going forward with a substitute teacher. We knew this substitute teacher – old, crotchety, and devoid of humor. Before we even knew what the day held, we hatched a plan. We were going to skip class. My two accomplices and I waited to implement our grand strategy. As the class exited the locker room, we turned left when they went right into the gymnasium. We scurried to the back of the locker room and waited for the sound of sneakers on concrete to dissipate. We had done it. We had escaped from the tyranny of that humorless substitute teacher. We now had a whole hour of freedom. Except, we were confined within the belly of the high school. We had not thought about that in our hasty decision. If we left the locker room, we would be caught. We were dressed in our gym clothes; if we went anywhere, it would be obvious that we were skipping gym class. Besides, it was too cold to go outside. The enthusiasm of our rebellion faded into boredom as we settled onto the locker room benches to wait out the class. We could hear the bouncing of balls and the excited shouting of games at play. However, it was too late to blend back into the class. The teams would have been picked and roles assigned. We would be caught if we tried to join the fun going on in the gym. We filled the time with the combination of head-locks, talk of girls and toys, and the typical silence of adolescent boys. Our banal discussion came to an abrupt halt when we heard a door open and close. Someone had entered our sanctum. Footsteps began to fall on concrete with the unmistakable sound of an adult. To our horror, the footsteps were heading directly toward us. We retreated deeper into the locker room. We were going to get caught. I did not want to get caught. I was not sure what awful punishment would befall me but I did not want to find out. The footsteps were relentless in their progression. They were not deviating in the least. The even pace of each step mercilessly pushed into the confines of the shower/toilet room. There was no escape – we could not get out. Yet, our rebellion was not done. We were determined not to get caught. Our only choice was to hide. A co-conspirator and I entered the toilet stall with its walls and doors. 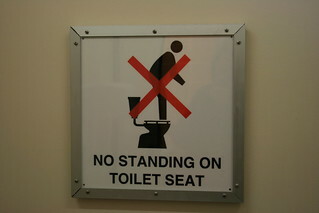 We quickly perched ourselves upon the toilet seat, so that our pursuer would not see our feet, and closed the door. There we waited, backs to the wall, frightened face to frightened face. In hushed silence, we listened to the footsteps. He had come into our section of the locker room. 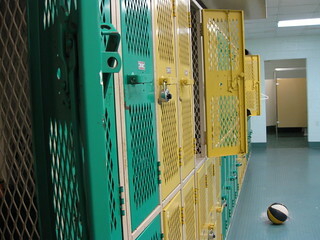 He was coming down the row of lockers, clack, clack, of one foot step after another. He was taking a direct route to our confine. Does he know? How could he know? On he came; one step after one horrible step, until we heard the steps stop just outside our toilet stall. Could it be that he has to go the bathroom? 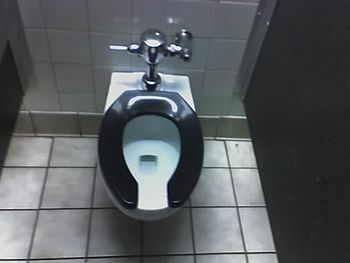 While the footsteps were bad enough, they were nothing compared to the bang on the toilet stall. I was lost in my hope of escape. So, the bang nearly frightened me off of my perch and into the water below. We were frozen until the next bang was followed by the words, “come on, get out of there”. It was over. We were caught. I don’t know how. He must have been part blood hound. I reached over from my perch and unlatched the door. As it lazily swung open, I received the most disapproving look of condescension in my life. There the varsity basketball coach stood with two of the most pitifully idiotic teenage boys still perched upon the toilet seat before him. He did not say anything other than, “let’s go” with a roll of the eyes and a shake of the head. And with that, our rebellion was over. We had been caught and now had to make the humiliating walk to the principal’s office in our gym clothes. I later found out that our rebellion had saved us from the best day of gym class, ever. The substitute teacher had let everyone play whatever they wanted to do, while he read the paper. I had rebelled against supervised freedom for unsupervised confinement and punishment. That had not been a good choice. How often do we make this sort of bad choice in our spiritual lives? We rebel against God’s instruction in anticipation of freedom and pleasure. We refuse obedience because it seems like we are being forced to do something awful. We run from the presence of God thinking we can escape only to find that what we have escaped to is not as we had imagined. It is foolish to think that our rebellion and sin will not be discovered. God will relentlessly pursue us. He will back us up into the confines of our own choosing until we are revealed perched upon the toilet seat of bad decisions. While we have endured the anxiety of being pursued by God, what have we saved ourselves from? Love, joy, peace, patience, kindness, goodness, gentleness, and self-control…yeah, that is horrible. How idiotic is it to run from real freedom under the loving supervision of our heavenly Father for the unsupervised confinement and punishment of rebellion and sin? Seems like an easy choice to me. Funny story, but it goes to show that we don’t always make the best decisions. Thank you so very much for the reblog. “God will relentlessly pursue us. He will back us up into the confines of our own choosing until we are revealed perched upon the toilet seat of bad decisions.” Wow, that’s good! “Who in the days of his flesh, when he had offered up prayers and supplications with strong crying and tears unto him that was able to save him from death, and was heard in that he feared; though he were a Son, yet learned he obedience by the things which he suffered; And being made perfect, he became the author of eternal salvation unto all them that OBEY him,” (Hebrews 5: 7-9). Thanks JD, love the analogy. But even if we don’t learn from our first bad choice, God always brings us back, no matter how many times we stray. It’s never to late to learn that – and it’s never too soon!